When it comes to places to visit in Spain, the possibilities are limitless and exciting. Even after living here for a few years, we find its fascination only deepens and there’s no end of stunningly beautiful and culturally rich experiences. We’re not the only ones who think so. Last year Spain was rated number two among the most popular travel destinations in the world, even surpassing the US. It welcomed more visitors than ever before. The great news is that there are still plenty of places to visit in Spain that are unique, uncrowded, and give you an authentic experience of Spain and all her splendor. We have visited these places ourselves and discover they are still unknown to the average tourist, making them our recommendation to you as the top 5 places to visit in Spain for 2018. Take our posts with you! Get access to our posts guides via the GPSmyCity App, for on and offline access and GPS capabilities. 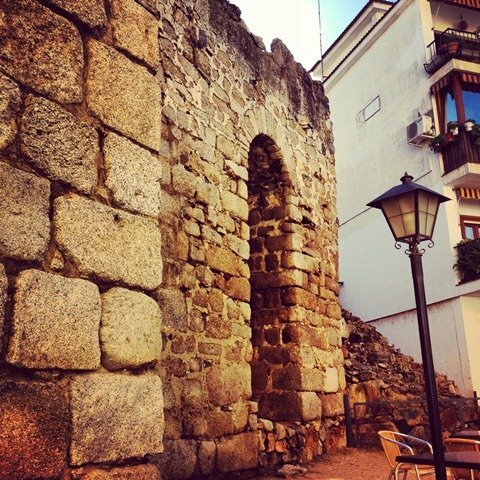 This small town in the region of Extremadura, is one of our favorites. Yes, because Eric’s last name is also ‘Trujillo’, but there’s more reasons why we love it. The town and surrounding region are home to some amazing history, and it still maintains its old-world beauty. Let’s start with Trujillo’s history. One of the most famous conquistadors of the New World came from this very town, Francisco Pizarro. He was from Trujillo and conquered the Inca Empire and the area we today know as Peru. His brothers, Francisco de Orellana and Hernando de Alarcón, were also conquistadors and aided him in this expansion of the Spanish Empire in Latin America. Their conquests became Trujillo’s success and enriched the town as well. In the town are still the family palaces that they built. Today these are preserved, historical sites that can be toured. It’s a very up-close encounter of the role Spain played in Latin America at that time, and vice versa. 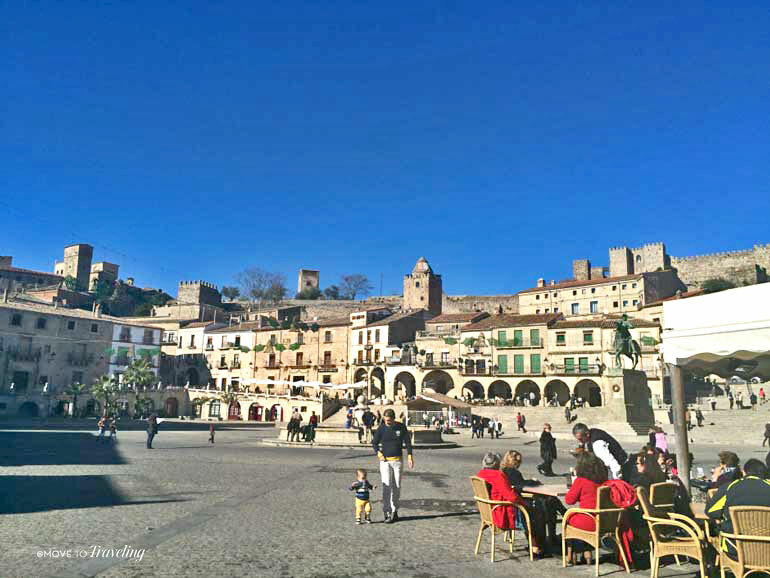 The architecture throughout the entire town is very old, with a charming Plaza Mayor. 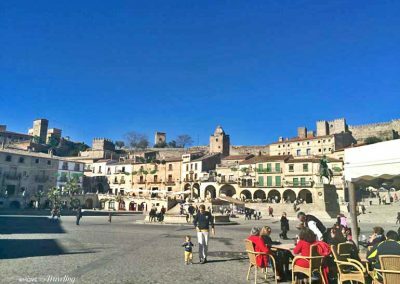 A hill called ‘Cabeza del Zorro’ rises up from the side of the plaza, on which sits the castle and other beautiful historical buildings. 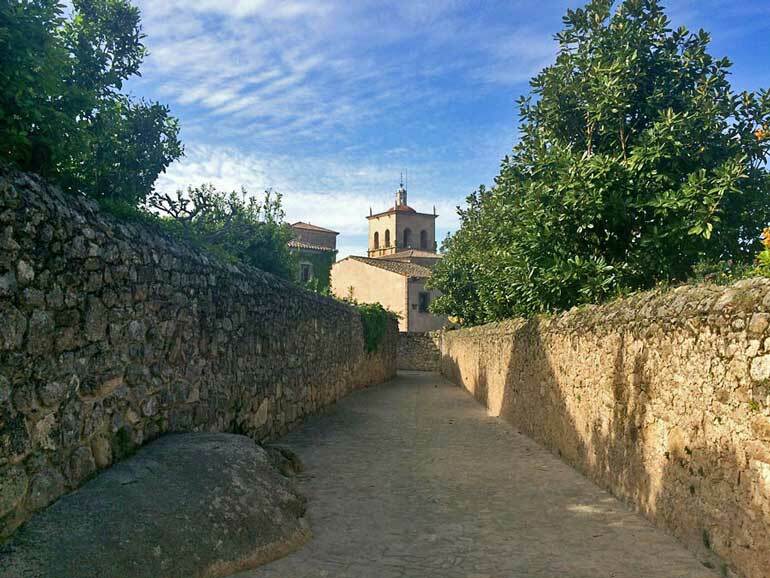 Enjoy walking these narrow, cobble-stoned streets and passing ivy-strewn stone walls. And of course true to Spain, there are plenty of little cafes and lovely boutique hotels and villas, hidden away around every turn. Here you can dine in a picturesque setting, savoring the delicious local gastronomy. 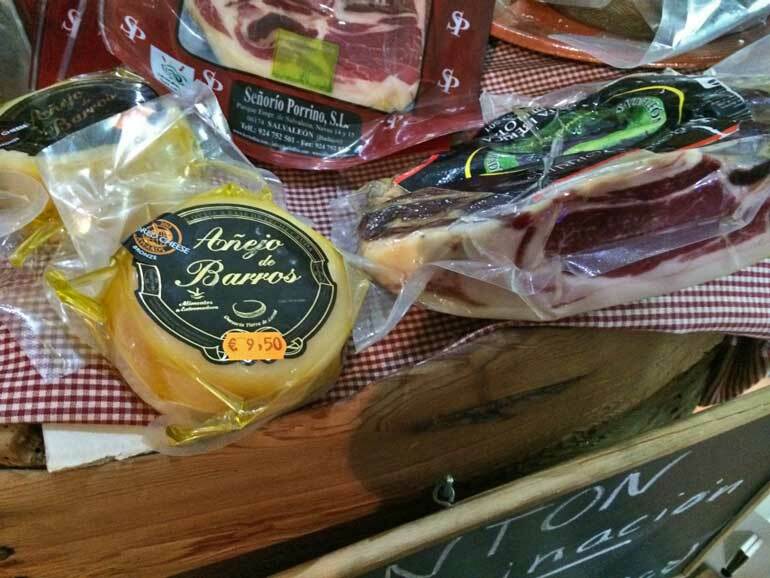 They are especially known for their Spanish sausages, cheeses, and local wines. Francisco Pizarro had a daughter with an Incan Princess and when she was 18 years old, she came to Trujillo to marry her uncle. She lived the rest of her life in Trujillo as a great lady of fortune and loved by the community. 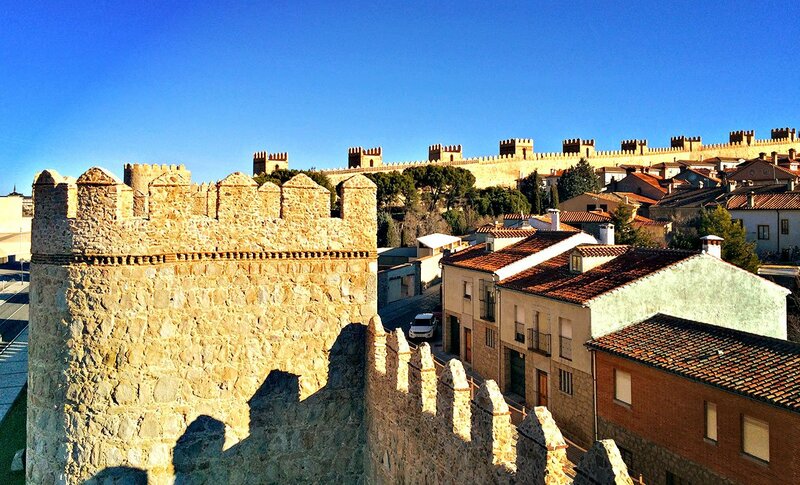 The most popular, and must-see site of Trujillo, is its castle. It’s only a few euros to get in and very authentic and well maintained. The views from the top are also breathtaking. 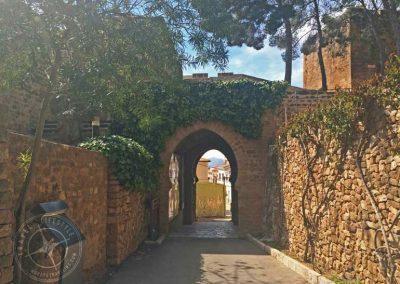 Originally built by the Moors as an ‘alcazar’, and later belonging to the Christians, it’s the epitome of a medieval castle. 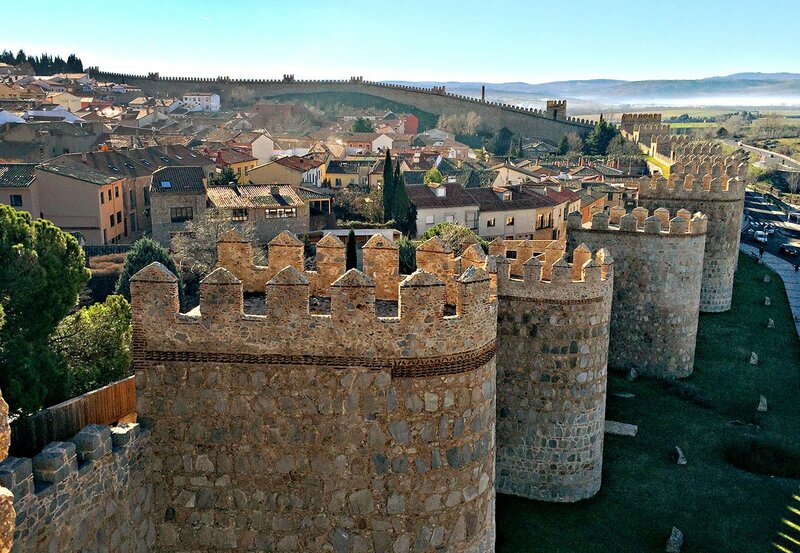 Even scenes from last season’s Game of Thrones was shot from the Castle of Trujillo. You GOT fans are going to love this! 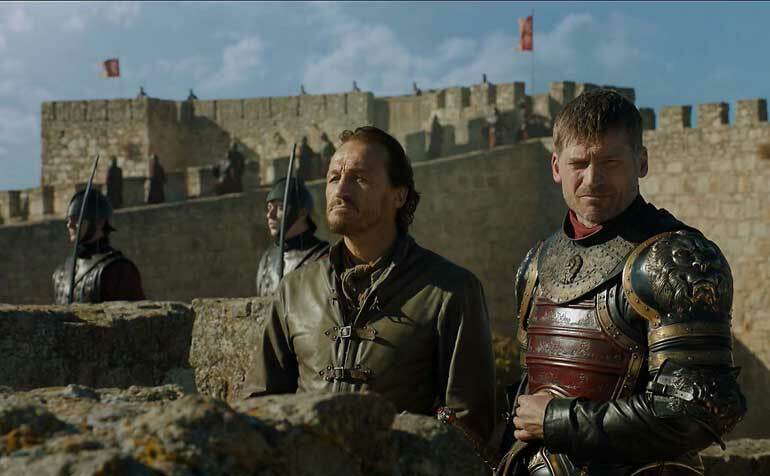 Remember the scene (it was episode 7 of season 7) where Jaime and Bronn are watching from a castle wall, waiting for battle? That was shot in the Trujillo Castle. 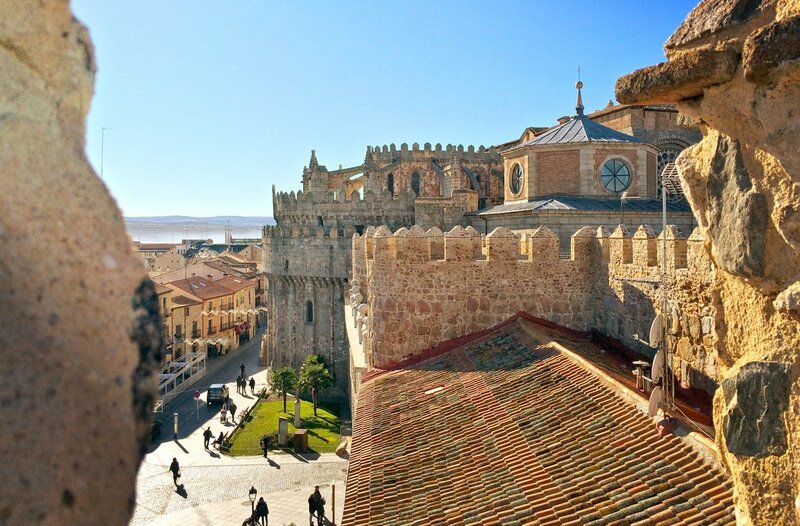 For other filming locations of Game of Thrones in Spain, last season also had scenes shot in the nearby town of Cáceres and its countryside, which is also among the top places to visit in Spain. Above Image – Screenshot of the scene shot in Trujillo Castle. Getting to Trujillo is most convenient by car from Madrid. There are also plenty of buses, and the tour buses can be quicker. 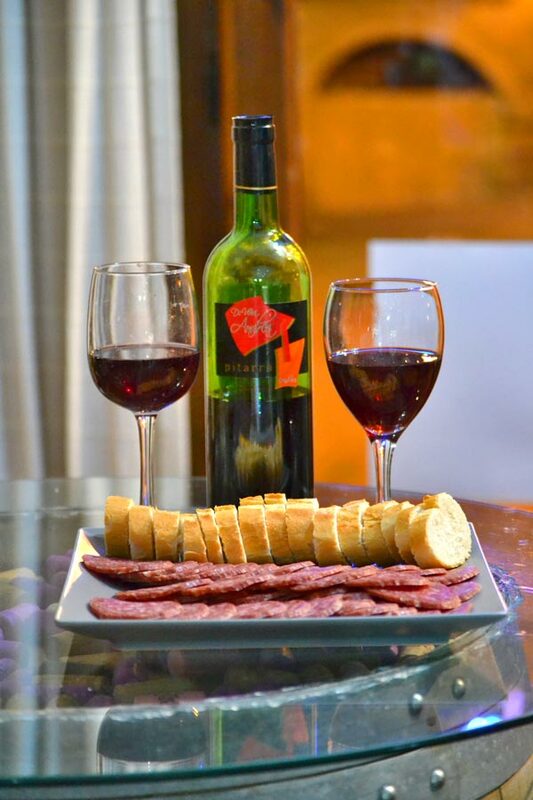 If you’re into wines, you can look into taking a wine bus to Trujillo. For accommodations in Trujillo, we can recommend from our own great experiences the Hostal la Cadena, which also has a great restaurant. We think it is a great, inexpensive hotel for budget traveling, and it is located right in the Plaza Mayor. For a more upscale experience, there is the Parador of Trujillo, which is part of the Castle itself. 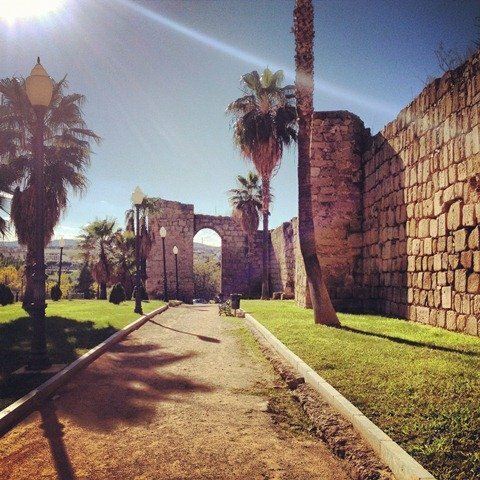 From all the towns in Spain, Mérida reminds us the most of the movie ‘Gladiator’. Why? Must be the incredible Roman Amphitheater of Mérida that continues to draw crowds, perhaps much like it did back in the Roman days. Good thing is, it doesn’t draw ‘barbarian hordes’ (we know, cheezy, but we love the movie – remember that line?). We of course mean typical tourist crowds. Yes, it gets busy in the summer months and is growing in awareness and popularity, but again, reason why 2018 is the year to make your visit, before it becomes even more discovered. Mérida will have you venturing even further into Spain’s ‘wild west’, the region of Extremadurawhere Trujillo is also located. And yes, the name stands for the nature of the land – extreme hard. But in our times today, it is the beauty and relaxation of its gorgeous nature that we get to experience. 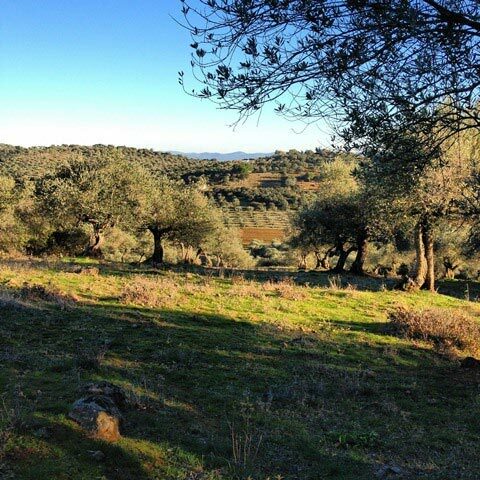 Imagine rolling hills and dark green-leafed olive trees spreading out in beautiful vast vistas. Black Iberian pigs roaming acres of land feasting on acorns, and white fluffy sheep grazing and still being led by shepherds. Don’t be surprised if the only traffic you experience is having to wait for them to cross their flock across the road. Now getting back to the town of Mérida. 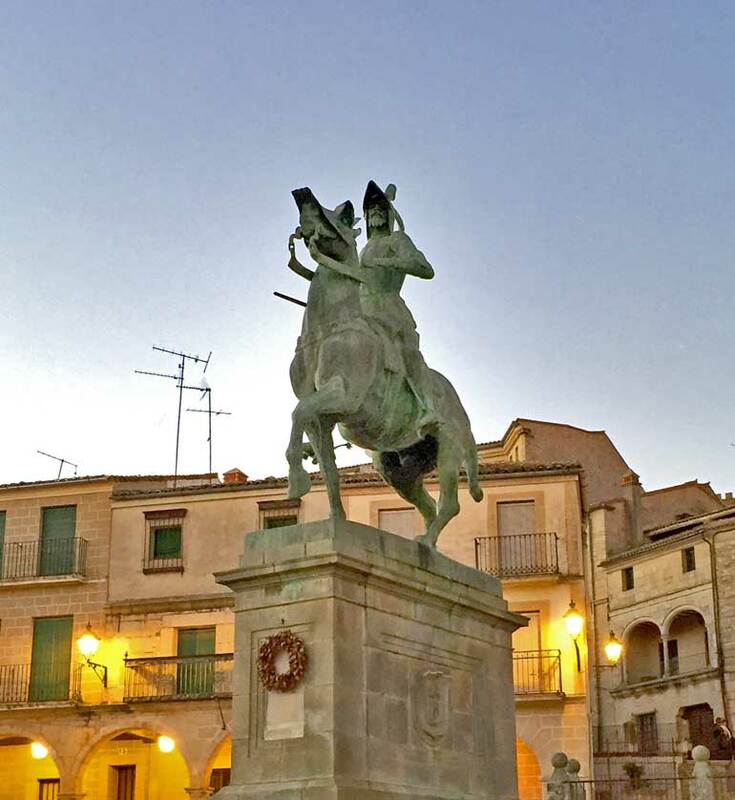 It is also the capital of Extremadura and can be considered a larger town / small city. 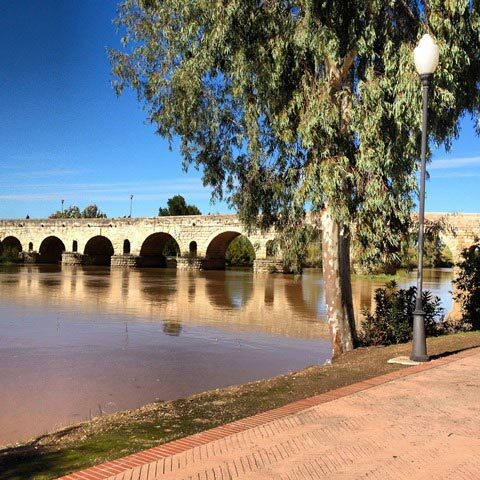 There is the famous Guadiana River that flows along side it and its gorgeous, roman bridge that still spans the water to the city’s historical center. This Puente Romano of Mérida is the longest of all existing Roman Bridges and is one of several historical sites that Mérida is well known for. The town is still such a testament to the history of the Roman Empire. It was known for where successful and rich Roman Generals would retire, and was the most important Roman City in the Iberian Peninsula. Once again, UNESCO is all over this place – Mérida is a UNESCO designated world heritage sitealong with other remarkable ruins. What is impressive is the amazing condition that many of these ruins are in. They’ve been well restored and are maintained, and more ruins and artifacts continue to be found. 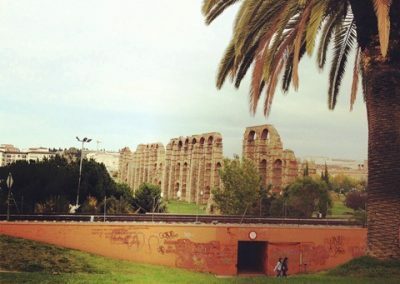 Another remnant of its Roman history are the impressively large aqueducts that are still standing along one side of the city. Even walking throughout the town center, you come upon ruins that may have been recently discovered, when a building was being renovated or torn down, and you begin to realize that you and the city are on top of the original Roman town, still there below you in the ground. One of the things we like about Mérida is that it’s charmingly simple in many ways and not posh or glamorous. It’s down to earth and there’s a relaxed rhythm to things there. When you go, take the tourist train that starts across from the entrance to the Roman Amphitheater. We usually don’t do these, but this was great and really worth it. The tourist train helps you cover more ground in less time so you see the majority of the ancient sites which are spread out all over the town, and without exhausting yourself. If you go in the summer, especially look up if you’re there for their annual ‘Noche Blanca de Mérida’ or White Night, which is on a full moon night. 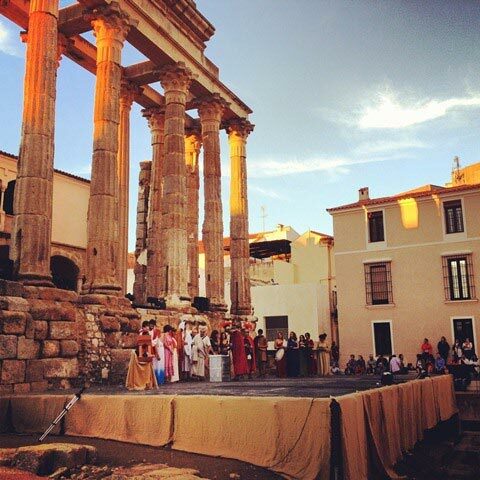 People dress up in Roman attire and many of the locals are part of theater groups who do reenactments at the different historical roman sites. The grand finale is a reenactment of a gladiator tournament in the actual Roman Amphitheater which takes place around midnight and under the full moon. Amalia participated one year, dressing up Roman-style as well and getting to see the historical sites in the full moon. She highly recommends the event. 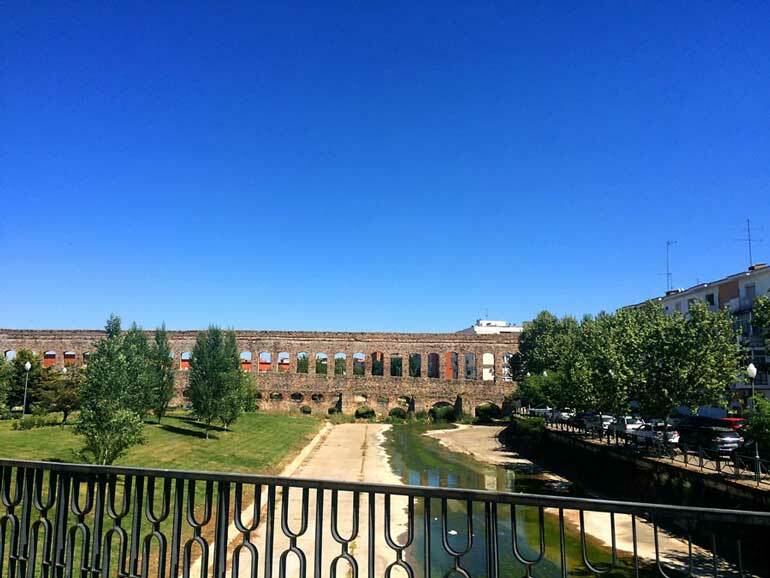 You can get to Mérida directly from Madrid by train, bus or car. Take your pick. Regarding accommodations, we have not stayed overnight in Mérida (yet). But we would recommend the Parador of Mérida, once again for a nice stay in a wonderfully restored historical palace. 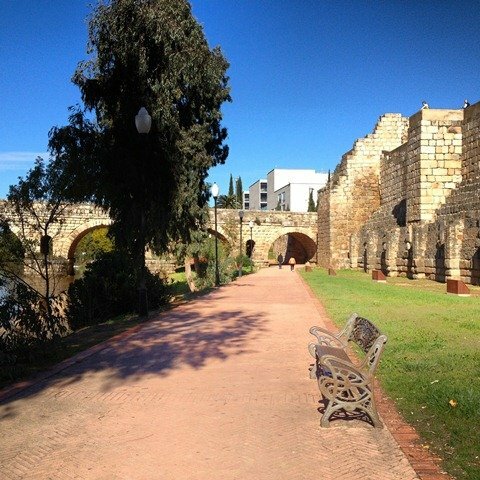 It’s located right on one of the main plazas and within easy walking distance of the Puente Romano (Roman Bridge) and the largest remaining portion of the Medieval wall bordering the river. 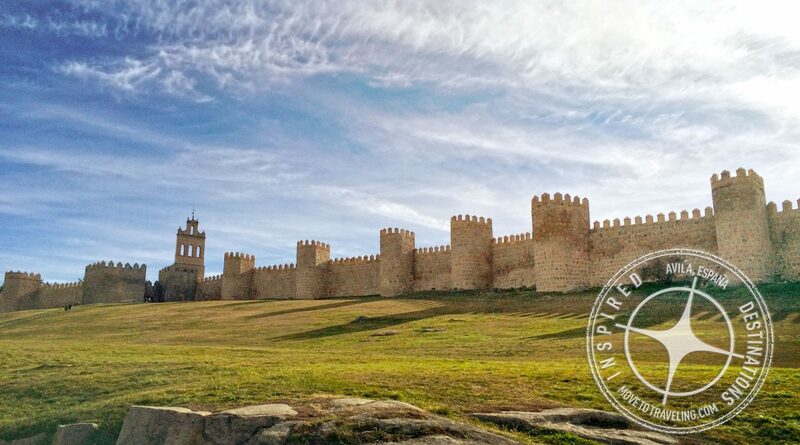 Designated a UNESCO World Heritage Site, Ávila also takes you back in time with its ancient historical sites. Its Medieval Wall is the highlight. 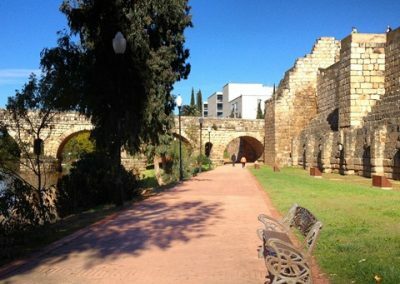 The impressive wall still surrounds practically the entire town, one of the few of its kind still standing so intact and in such marvelous condition. You can walk almost the entire wall along the top, which gives incredible views of the surrounding landscape. There are numerous towers along the top of the wall, most of which you can walk up into. In addition to the wall, the town’s center is composed of old-world architecture. Wherever you walk you feel like you’re back in time, realizing that the streets you’re walking have been around for ages. There are plenty of great places to stay in boutique hotels that have restored ancient manors and palaces. Ávila is also known for its cultural events which promote film and a large Medieval Festival of Ávilaevery year. Their cuisine is delicious and varied, thanks to the diverse terrain and climate throughout the area. Some of their traditional dishes are ‘Chuletón de Ávila, a veal chop, and suckling pig, all based based on local breeds. 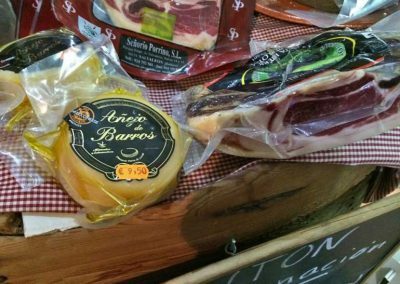 They also have their own recipe for chorizo sausage and are known for their ‘Judías de Barco’, also known as ‘pipos’, which are large white beans that come from the nearby village of ‘El Barco de Ávila’. But wait – there’s more! Ávila has a fantastic tapas tradition, or as they say ‘ir de pinchos’, meaning ‘we go for pinchos’, which are like tapas but many times served on a piece of fresh bread. Whenever you order a drink here, you get a free tapa or pincho of the local delicacies. Overall, Ávila gave us the distinct feeling of being on the movie-set for ‘El Cid’ The town sits in the middle of a large, open valley that is surrounded in the distance by mountain ranges. Ávila is only 1.5 hours drive from Madrid, which is scenic with mountainous terrain, and is also on the way to Salamanca. You can also travel there in bus, but by train is as quick as driving and a gorgeous ride. 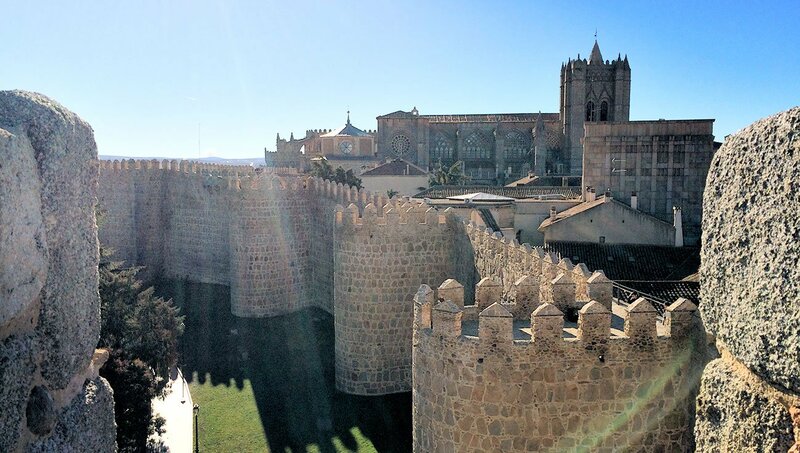 For where to stay in Ávila, we highly recommend the boutique hotel we stayed in, Palacio de Monjaraz. This 16th century palace was restored as a family project and is in the very heart of Ávila, close to everything. Better yet, the same owners, a local family, also own the fantastic restaurant just across the quaint narrow street it is located on. 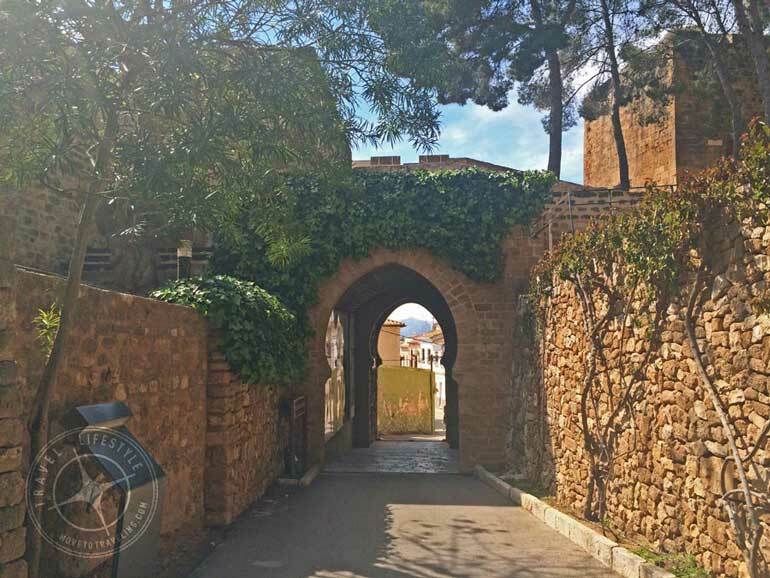 Restaurante de Cine, formerly known as Restaurante la Alcazaba, was such a wonderful and delicious experience, that we ate there twice in the three days we spent visiting Ávila. When in a new place you repeat a restaurant experience during a short visit like that, chances are it’s good. 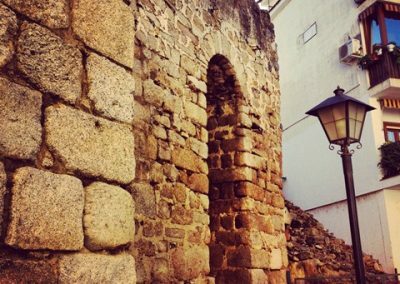 From these two places in Ávila, you’ll have a great base for exploring this magical, medieval town and its surrounding area. Enjoy reading our article about Ávila for more stunning photos of the town and the hotel where we stayed. Since we live in Dénia, we especially love it and have great recommendations. We also know of some new exciting things that make it especially great for visiting in 2018. And let’s not forget, it’s a great place to consider for living in Spain. This summer the train from Dénia to Alicante is being re-opened after improvements for the past two years. The train is a great way to get to Dénia from the Alicante Airport. 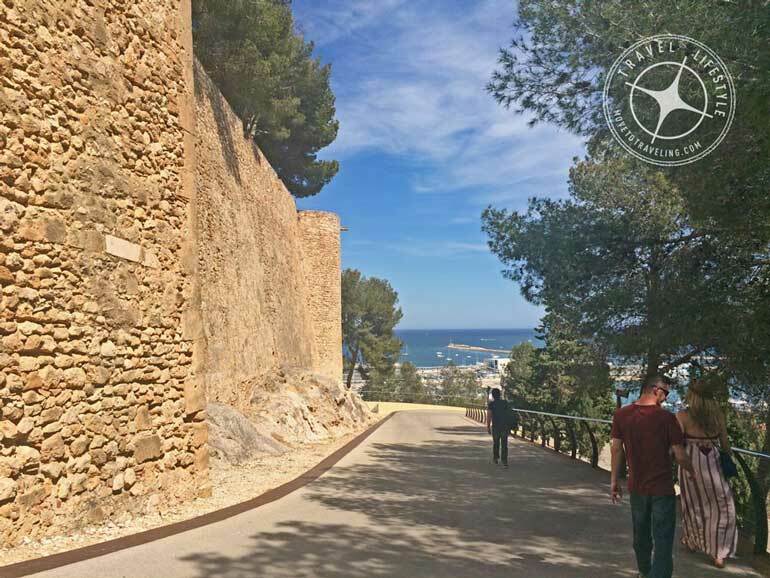 It’s also a beautiful ride, going right along the Costa Blanca with views of the turquoise Med waters and stopping at various other interesting seaside villages, like Calpe and Altea. It does stop in Benidorm as well, but we’re not big fans of that place. To each their own though. 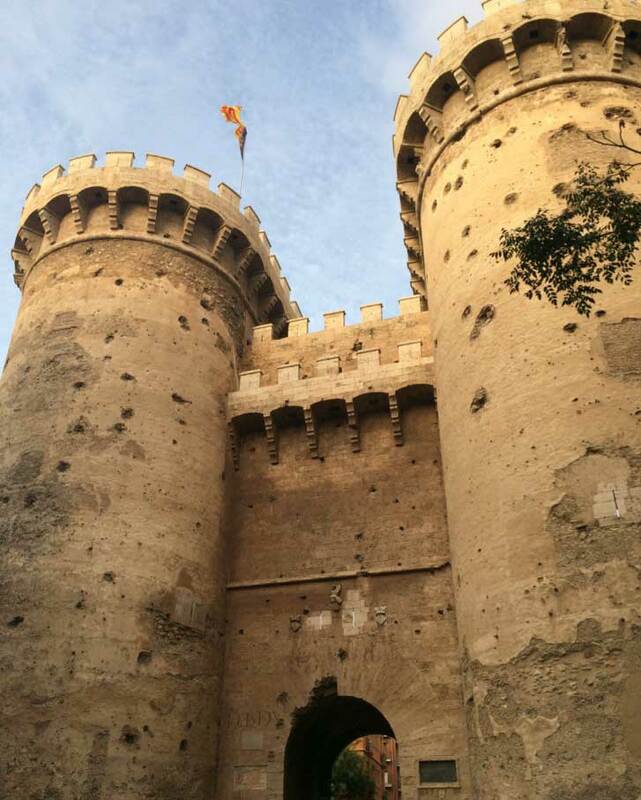 The Castle of Dénia, which we adore, also just completed renovations. While there has been plenty to see at the castle up until now, this enhances and expands what was the governor’s palace and sits on the very top and middle of the Castle’s highest point. Amalia went to the inauguration recently and really enjoyed the beautiful work done. The large, existing staircase was wonderfully restored and in an original chamber underneath, is a small museum that tells the story of the building and displays old photographs. We love this castle because it sits right on the sea and also in the middle of the town. From all throughout the castle, and especially the very top, there are fantastic views all around. Also at the top is the larger, already existing Archeological Museum that is part of the governor’s palace. 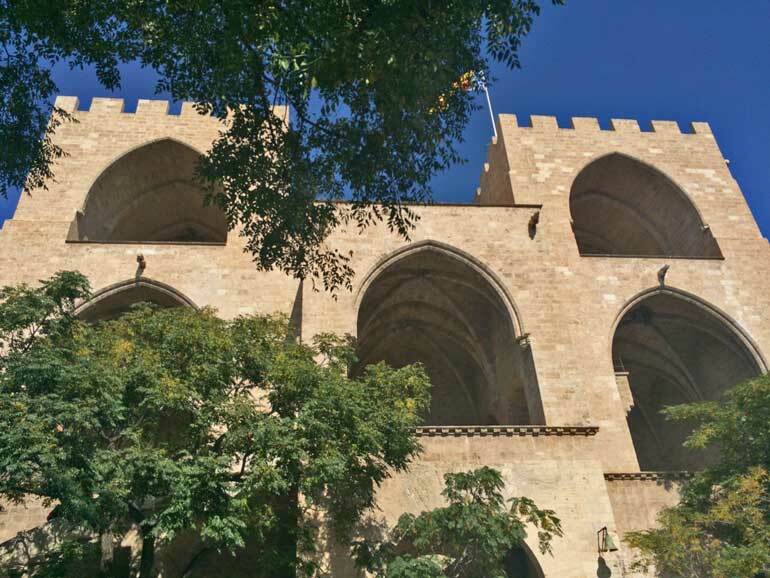 The incredible artifacts on display here reveal how long ago Dénia’s history goes back and that it has been home to several Mediterranean civilizations. You can catch a ferry from Dénia to the Mediterranean Islands of Ibiza, Fomentera and others. Only a few years ago the main ferry company, Balearia, set up it’s headquarters here in Dénia’s Marina Portet. It involved a reconstruction of the marina, as well as a new marina being built, the Marina de Dénia. So even though Dénia is of that ideal ‘town size’, it has two beautiful, new marinas. In addition to the Balearia Ferry being here, this means a lot of lovely restaurants and shops right on the water. 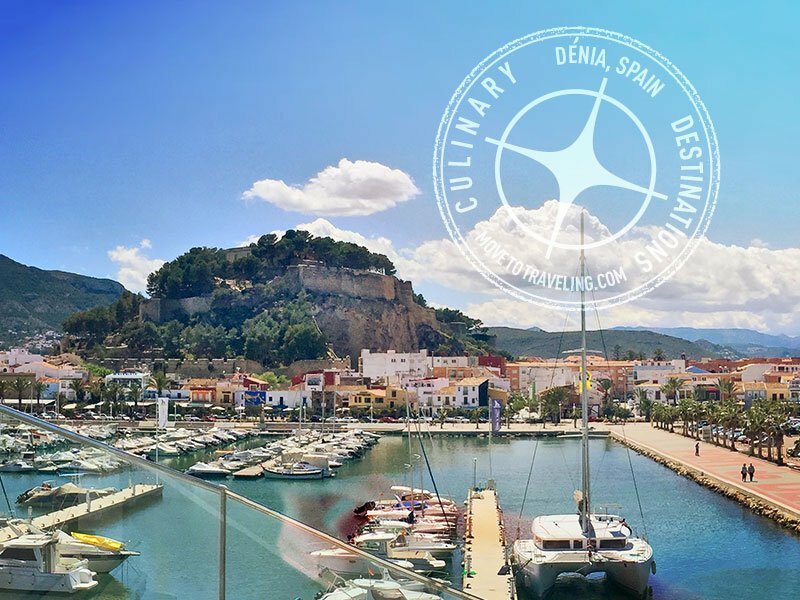 Speaking of food, Dénia has been designated a UNESCO Creative City of Gastronomy and prides itself on its fresh, local cuisine. 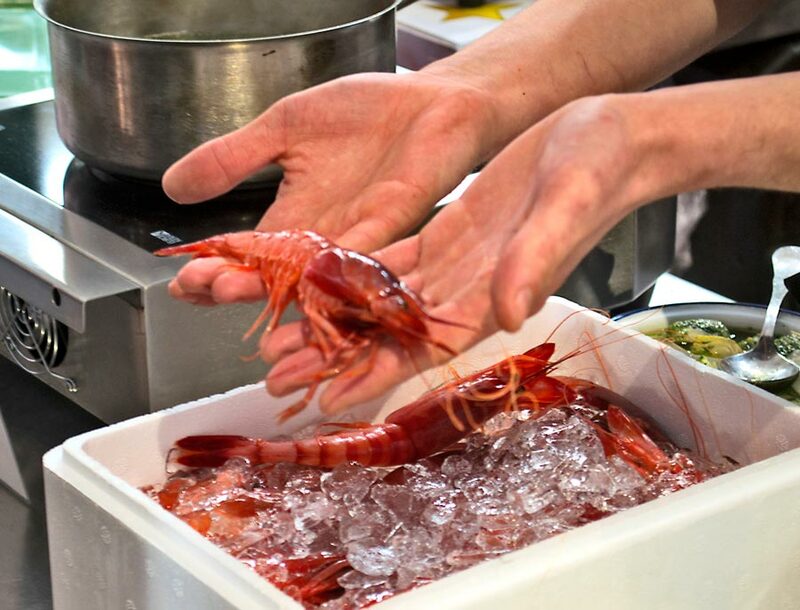 For decades,they have been preserving their old-world Spanish and Valencian culinary traditions while also encouraging and incorporating innovation and creativity. 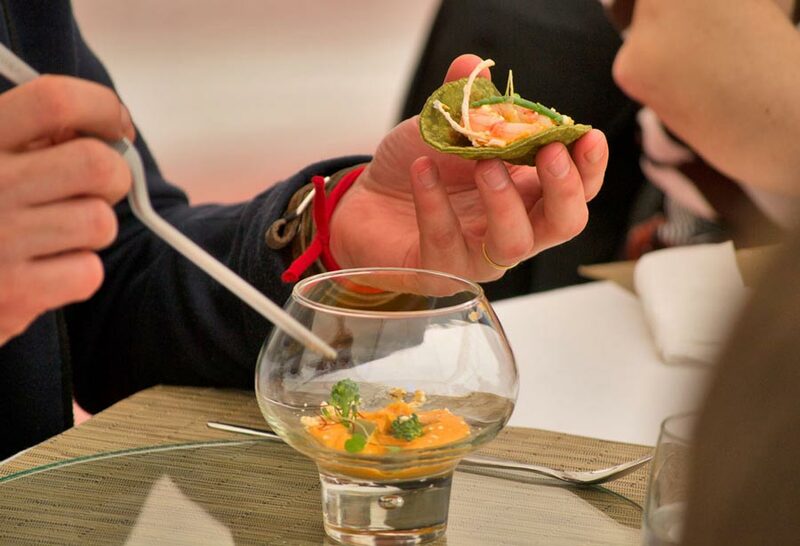 Hey, we’re big foodies and we’re living here, a testament to the fantastic gastronomical scene. 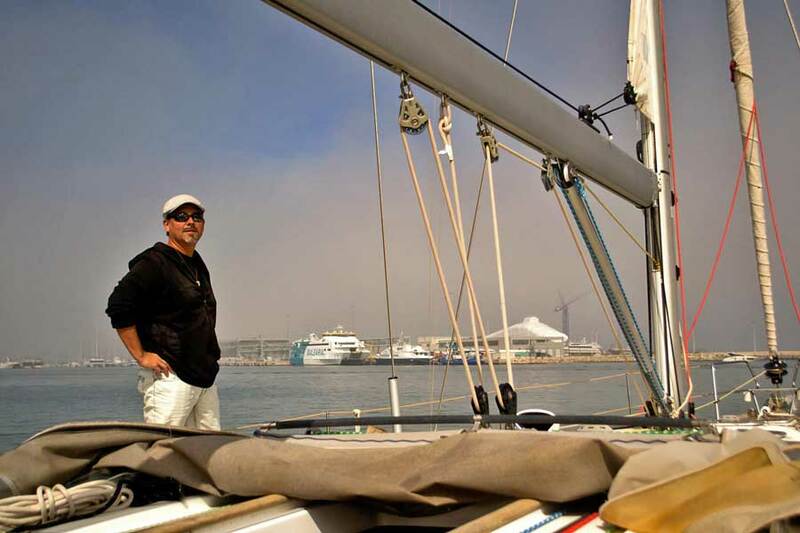 Dénia is also a great place for those of us who love to sail. 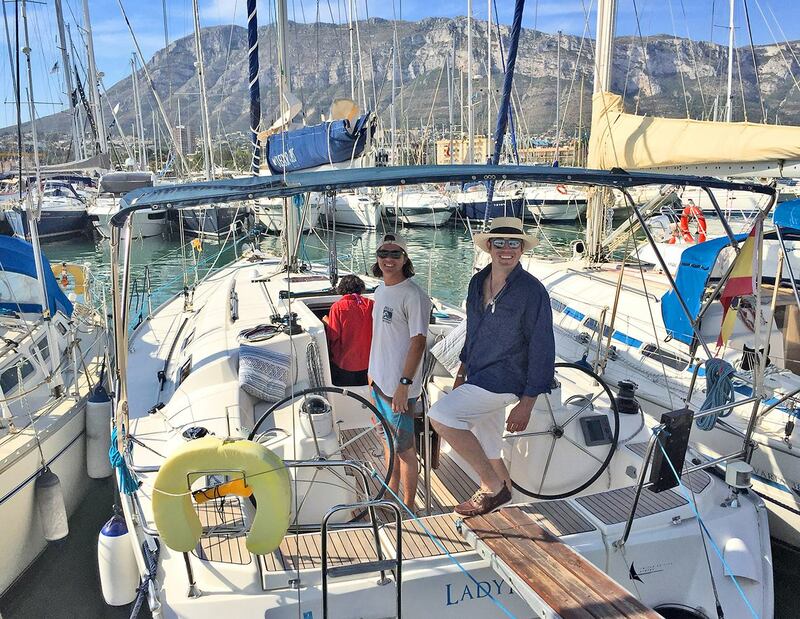 The sailing along the Costa Blanca is wonderful and there’s a variety of great charter companies to hire. There are also smaller ferries that do short trips throughout the day from Dénia to Javea, and other of the small towns not much further down the coast. Speaking of the coast, the main, obvious appeal are the splendid beaches that Dénia has. But note that we said ‘beaches’. You get your pick of three different ones, each distinct and all gorgeous. At one end of town is Las Marinas, a pleasantly long stretch of sand with calm waters and Chiringuitos (beach bars), going on for kilometers. Then there’s Marineta Casiana, a lovely small sandy bay with clear, shallow waters, located at the other end of town and just alongside the Marina de Dénia. Lining this beach is a broad walking boulevard raised slightly above the beach, and lined with fragrant pine trees and palms. Continuing from here, it feels like another world appears – the area of Las Rotas. Here the coast is immediately transformed into the rocky shores and coves typical of the Mediterranean. Think Greece here. The waters are sparkling clear and full of fish, there are little Spanish restaurants perched up and balancing on the rocks in some areas, their white terraces right over the water. All along here is a tiny narrow street for the beginning part, but it’s known and natural that pedestrians mainly use it and have the right of way. 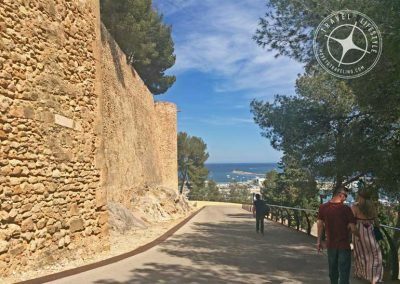 Las Rotas also goes on for kilometers and for some parts are closed to cars, making it an ideal seaside walk or bike ride. All along are places to get in with a snorkel and explore with the fish. 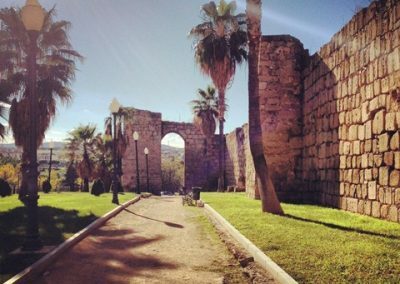 It really is stunning and one of our favorite parts of Dénia. Dénia is also great to visit this year, because it’s tourism has been growing, yet it is still not overly crowded. This means that you get that fantastic local feeling, but also benefit from improvements the town is making (to impress all you visitors of course). During August it gets quite busy, yet even then it is mainly other Spaniards who come to vacation, especially ‘Madrileños’ from Madrid. It is also popular among Brits and other Europeans. We expect that in coming years it will be even more discovered by travelers from the US, but up to now, hardly any Americans know about Dénia. We love how Dénia has maintained an authentic Spanish feel and style, along with its beautifully rich Valencian culture. Here there is an even deeper level of getting to know Spain, and many things to learn from her. It’s an ideal size, not too big and not too small. And it is conveniently located within the Mediterranean and right between Valencia and Alicante. For places to stay in Dénia, checkout the Hotel Nou Roma, which also has a few other great restaurants throughout the town. The Hotel la Posada del Mar is another great option, right across from the fish market and the Marina de Portet. Both of these boutique hotels are owned by local families and are in the center of town and close to everything. Above Image – The Longa de la Seda, or Silk Exchange. It’s time to throw a city into the mix, Valencia. For all those who want a relaxed metropolitan vibe (Spanish style of course), this is the place for 2018. It’s got the best of all Spanish worlds – the sunny Mediterranean Coast, historically charming sites, modern architecture, and so many beloved characteristics of what the world loves most about Spanish culture. Goodness! We could really go on and on. And so we shall. There’s the icon foods of paella, Horchata and other mouthwatering tapas. The per capita of Michelin Star restaurants is still rapidly growing, giving testament to the gastronomy scene here. If you’re a foodie, this is another place you’ve got to check out. Above Image – Tapas at Vinostrum, a great bistro in the Barrio del Carmen. Yet Valencia is such a charming, somewhat-still-secret. While it’s a city, it’s not too big and not as sought out (yet) as its more over-crowded sister cities, Madrid and Barcelona. 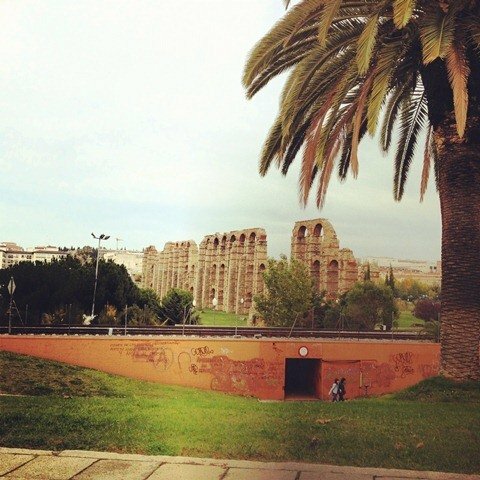 And come on, Madrid and Barcelona are great (we love them), but they are still so typical, first-time-to-Spain-sites. Valencia on the other hand is that thrilling blend of a hidden secret being found. What gives it that magic sheen of non-typical is that it’s also about the Valencia Community, not only the city, and its Valencia Culture. 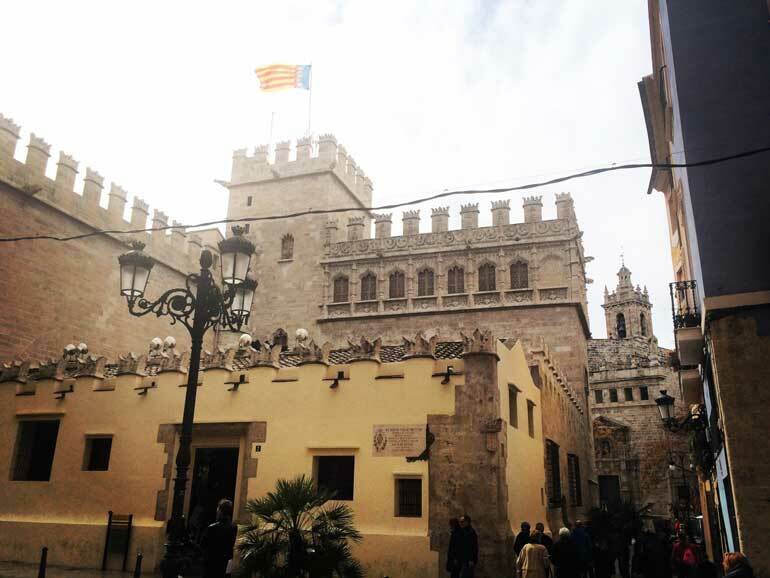 Here you can see romantic, historical sites like the remaining two towers of the cities original Medieval Wall; the Torres de Quart and Torres de Serranos. There’s the Longa de la Seda or Silk Exchange Building, just across from the gourmet heaven of the Mercado central, one of Europe’s largest and historical indoor markets. Above Image – The Torres de Serranos. 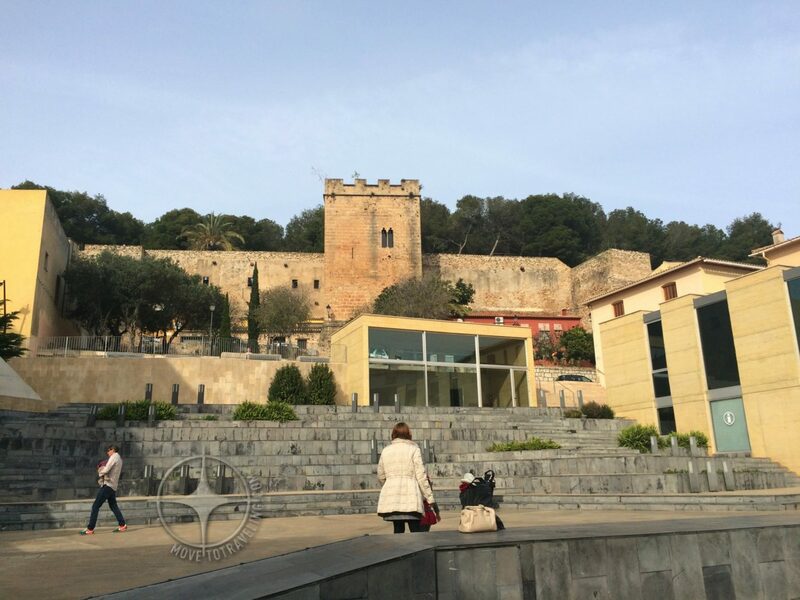 Above Image – The Torres de Quart. The whole city just vibrates deliciousness and beauty. There are orange trees everywhere, quaintly planted in sidewalks, courtyards, and random plazas and green parks. 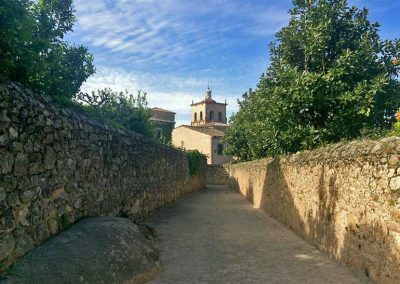 Wondering down old winding streets or broad modern boulevards, you can easily stumble upon picturesque terrazas and tabernas for the local ‘Agua de Valencia’. Or better yet enjoy the authentic ‘vermut casero’, which you can also request as ‘vermut artesano’ if they don’t make it in house. Ask for either to make sure you don’t settle for Martini ever again. 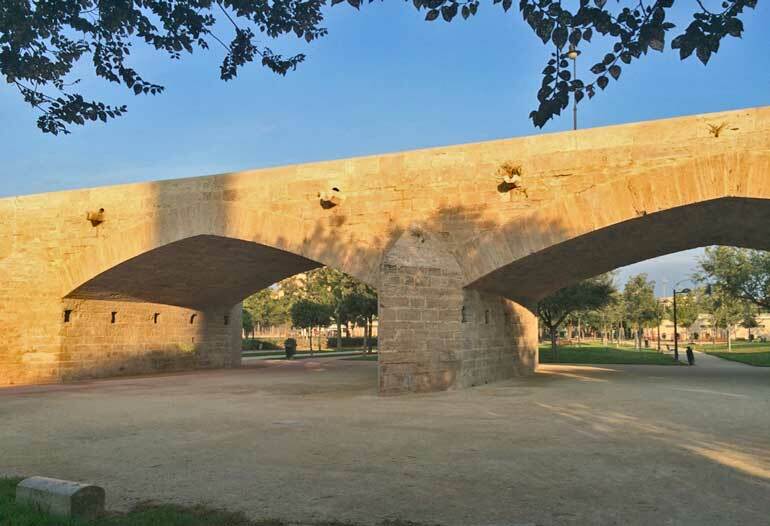 After walking the buzzing historical center, enjoy the Turia Riverbed Park where you can take a siesta to sleep off lunch or walk it off with a pleasant stroll. Arching around the city’s historical center, is this gorgeous, renown park. Sunken below street level, this original riverbed of the Turia River is now one of the longest, continuous running paths in the world. It’s lush and green, with various walking paths and gardens winding through it. Talk about a picnic paradise. At one end is the Valencia Bioparc (also worth seeing) and at the other end is the City of Arts and Sciences, which is another popular and worthwhile site. The Aquarium and Les Arts Opera House are also great sites that are located here and during the summer, this space has wonderful outdoor concerts, many of which are free. Above Image – The City of Arts and Sciences. Of course, being right on the water, there’s also Valencia’s Mediterranean Beaches. It’s port and marina are impressive and provide great, quality places to eat. From Michelin Star restaurants in the marina to Chiringuitos (beach bars) on the sand, you can have a tasty, Spanish beach experience. Regattas are held here during the year and if you’re into sailing, it’s also a great place to spend some time on the ancient waters of the Med. A port of this size also means that a lot of major cruise lines stop here, so if you fancy that mode of traveling, visit Valencia on your next cruise. For places to stay in Valencia? Well, there’s countless. Our first time in Valencia, we lived there for four months and stayed in a great AirBnB apartment. Since then, we have stayed in a boutique, budget hotel called ‘Zalamera BnB’. We had to catch an early morning train out of the Estacion Joaquin Sorolla, so this place was great because it is within close walking distance of the station. It’s clean and modern, budget-friendly and also situated within close walking distance to the other main train station in Valencia, the Estacion Nord. 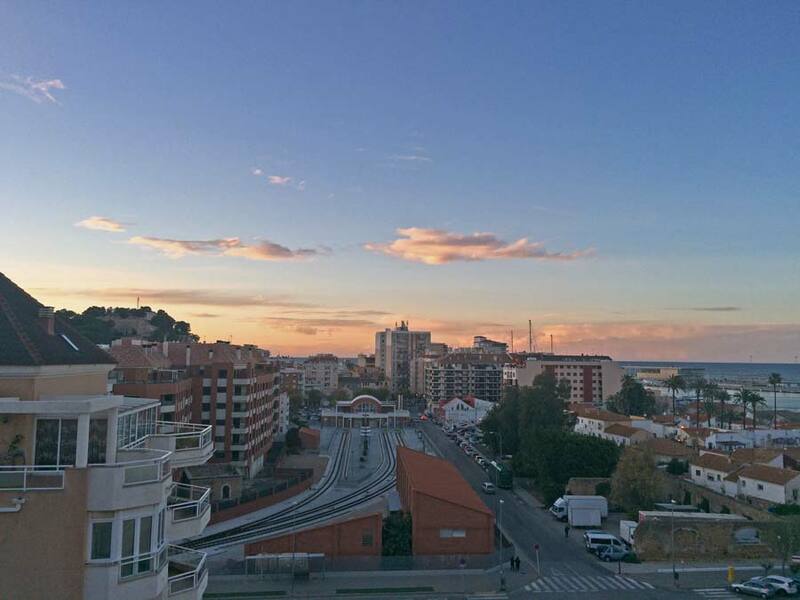 For an apartment to stay in, we have stayed in Valencia Flats Mercado Central and would recommend them. They have several buildings of flats throughout the whole city and in various styles. This one was really nice because it’s so centrally located in the heart of the historical center and just a block away from the Mercado Central and right behind the Longa de la Seda, the Silk Exchange. It’s a beautiful, happening location. Above Image – In Trujillo. 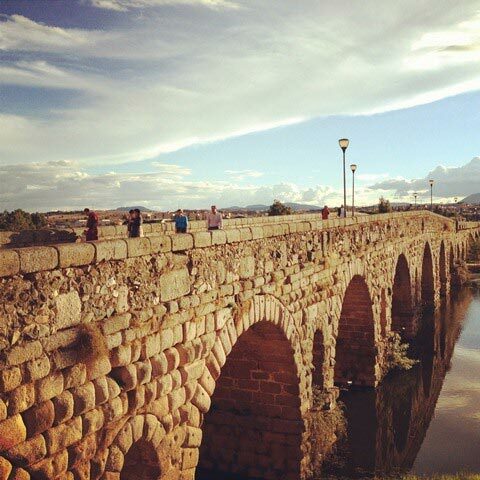 These places to visit in Spain, as well as countless others, easily immerse you into the local cultures and history. We say ‘cultures’ on purpose because there are various distinct cultures within Spain as a whole, just like other countries. In past years Spain has improved its tourism and is only getting better at it. With all that’s going on in the world, it’s also one of the safest, easiest places to travel to and to travel around once you’re here. The country is also welcoming and eager for visitors. Places like these five we recommend, and many others, introduce you to new aspects of Spain and take you even deeper into this charming, unforgettable world. Make sure that in 2018, you give yourself this amazing travel experience. Tell Us Where You Want to Travel in 2018 & WIN! We’re partnering with GPSmyCity to give away 10 free, one-year subscriptions (worth $18.99 each), and you could win! With this travel article app, you’ll get a year of full access to all their walking tours plus travel articles, covering 1,000+ cities worldwide. All you have to do is comment below about where you want to travel in 2018. It can be places in Spain, ones we’ve mentioned here in our article, or anywhere else in the world. Where do you want to travel in 2018? From the different people who comment, we will draw 10 winners at random, and contact you with your prize via your email provided as part of commenting. Your email is not subscribed to anything and is not shared with anyone. Entries made by the end of the day on June 27, 2018 will qualify for the prize. Are you new to GPSmyCity? We love working with them and have travel articles of our own offered as downloadable apps and self-guided city walks. Now they’re offering annual subscriptions available on iTunes. These include two options – for $12.99 a year you get full access to all travel articles for 900+ cities worldwide, and for $18.99 a year you get full access to all their walking tours plus travel articles covering 1,000+ cities worldwide. It will take your traveling to another level. Learn more about them in our previous article and giveaway, ‘Travel Article Apps, The Latest-Greatest Free Travel Tool’. We’ll be traveling in Andulucía in October, Mijas Pueblo, Malaga; then heading north to San Sebastian and Bilbao. We’ll be exploring as many areas as possible over the coming years with an eye to finding a base for a longer stay. Alexandre, your trip sounds fantastic! What great places. Have you been to each of those places before or are they return visits? Thanks for reading our article and participating for the GPSmyCity travel app. We’ll be in touch again soon.